As you can see from the picture, we had fun making our Allie Cats! You can make a large variety of Allie Cats by the fabric(s) you choose; add tiger stripes or not, and make happy smiling cats or sad, grumpy cats too! 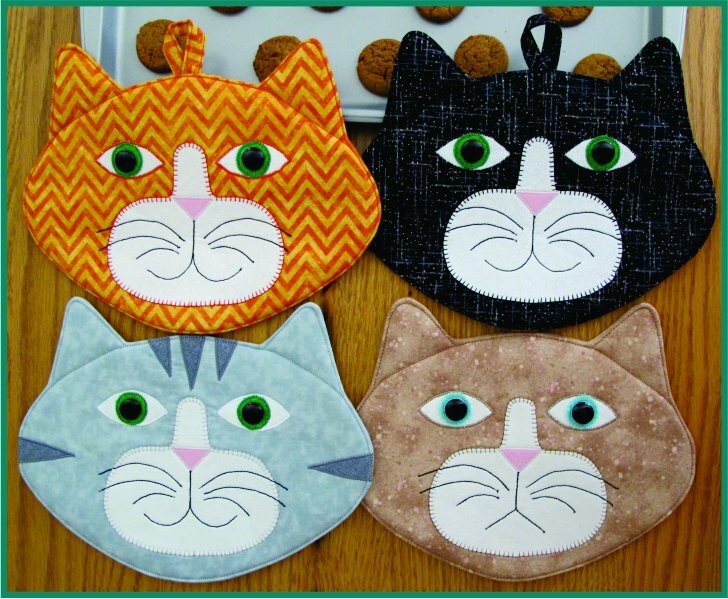 Includes pattern pieces and instructions to sew up some really CUTE Cat Pot Holders or Mug Mats. Super Quick & Easy! Approximate finished size: 7" x 9.5" (excluding ears). You DO NOT cut a back for the Ã¢â‚¬Å“Allie Cat FaceÃ¢â‚¬Â? piece- you donÃ¢â‚¬â„¢t need one. This approach could be something new to you, but once the Allie Cat Face has been appliqued, you build a stack following instruction #8 using the remaining Allie Cat Face fabric, Insul-Bright and the Warm & White Cotton batting. YouÃ¢â‚¬â„¢re using your appliqued Allie Cat Face as your template, and you just sew around the outer edges, through the stack, as instructed. This process saves time - you donÃ¢â‚¬â„¢t need to cut an extra piece, nor do you need to fussy-cut the batting(s), and the edges/basic shape wonÃ¢â‚¬â„¢t stretch out while stitching.